The JOIDES Resolution has left the Superfast hole and come back to port and this expedition is just about finished. While drilling, we went deep into the ocean floor, and got that much closer to the Moho, the boundary between the mantle and the crust. 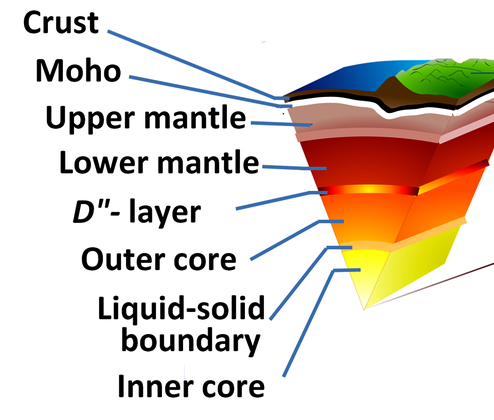 Geologists have wanted to reach the Moho for a long time and even have a name for this goal: the Mohole Project. To find out more about what the Moho and the Mohole Project are, read on. “Moho” is actually a nickname for the Mohorovi?i? discontinuity (which actually is just as fun to say as “Moho,” but becomes exhausting after repeated use). The Mohorovi?i? discontinuity is named after Croatian scientist Andrija Mohorovi?i?, who lived over 100 years ago. In 1909 he was measuring seismic waves from an earthquake near Zagreb, Croatia. Sesimic waves are energy waves that are sent out by earthquakes that can travel through rock and can be measured at the surface of the earth. Andrija noticed there was a place in the crust where seismic waves changed speeds, and theorized this was the boundary between the crust and the mantle. This boundary was named Mohorovi?i? discontinuity after him (and then people who have trouble pronouncing Croatian names started calling it Moho for short). Like George Clooney, Eddie Murphy and Lea Thompson (Michael J. Fox’s mom in Back to the Future), the Mohole Project was born fifty years ago in 1961. The idea of the project was to drill down into the ocean floor, through the Moho and into the mantle, which would help us better understand how the inside of the Earth works. Like the space program that was trying to put a man on the moon at the same time, it was an ambitious project. In 1961, at the beginning of the Mohole project, people drilled into the ocean floor for the first time and made it 234 feet deep, not quite to the Moho. This had a lot of benefits, though. It created new technologies, such as the dynamic positioning system that holds the JOIDES Resolution in place while drilling, that have been of great use for both scientists and businesses that want to drill into the ocean floor. It also showed that ocean drilling is a very effective way to help us learn about how the Earth works. The Mohole Project was the beginning of scientific ocean drilling that the JOIDES Resolution continues to this day. Even though our current expedition brought us closer to it, we still have not completed the Mohole Project and drilled all the way to the mantle. This is something geologists still really want to do, but it will have to happen in the future. Maybe you will be on the science team that finally goes to the Moho! PS. Knowing how much people under 16 years old like Smokey Robinson & the Miracles, I was going to write lyrics about the Mohole Project to the tune of their song “Going to a Go-Go,” which I was going to call “Going to the Moho,” but it turns out someone already beat me to writing a song about the Mohole Project. You can see a video of this song here. PPS. There is also a really old comic about the Mohole Project that you can read here.